The big news this week was the release of Australian convicted drug smuggler Schapelle Corby, who has spent the last nine years in a Balinese prison, but is now out on parole, with the proviso that she continue living in Bali where she can be supervised. To coincide with this event, Channel Nine put on the television movie Schapelle. There’s a lot of interesting names connected with the movie – Schapelle for starters – but the one I was drawn to was Orpheus, because Orpheus Pledger plays Schapelle’s half-brother James. If the name Orpheus Pledger sounds familiar, you may have seen him on Neighbours. Orpheus was a musician and poet in ancient Greek mythology. He was venerated as the greatest of all poets and musicians and called “the father of song” – according to one tale, it was the god Apollo himself who gave Orpheus his golden lyre and taught him to play it. Poets told how Orpheus’ music could charm the birds, wild beasts and fish, make trees and rocks dance, and change the course of rivers. The most famous story about Orpheus involves his wife Eurydice, a tree nymph. 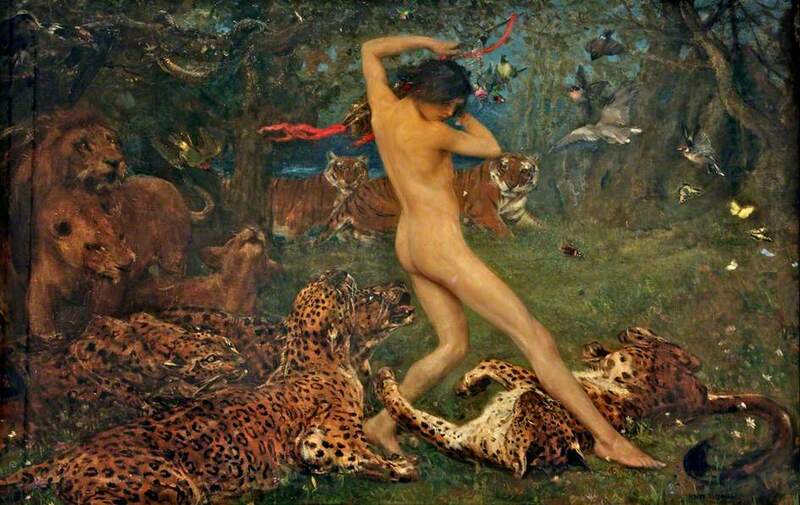 At their wedding, Eurydice was attacked by a lustful satyr, and in her efforts to escape, she fell into a nest of vipers and suffered a fatal bite on the foot. Orpheus was the one who discovered her body, and in his grief, he played such sad songs that all the nymphs and gods wept for him. They were moved to such pity that the gods advised him to try to get his wife back by travelling to the Underworld. Once he was in the Underworld, Orpheus sang before the god Hades and his wife Persephone. For the first and only time, their hearts went out to him in his plight, and they agreed that Eurydice would be allowed to return with him. There was just one condition: Orpheus must walk ahead of her, and never look back until they reached the upper world. Orpheus did what they asked, but once he was in our world, in his desperate anxiety he looked behind to see if Eurydice was still following. Eurydice disappeared, this time forever, and Orpheus’ heart broke all over again. This descent to the Underworld connects Orpheus to a myriad of mythological figures from different cultures, including Egyptian, Japanese, Sumerian, Hindu, Christian, Norse, Mayan and Celtic, who travel to the land of the dead. The figure who makes this journey returns with some “gift” from the Underworld, marking them as more than mortal, and suggesting the possibility of overcoming death. The story of Orpheus has inspired many works of art. Creators as diverse as Neil Gaiman, Stravinsky, Jean Cocteau, Franz Liszt, Tennessee William, Poul Anderson, and Andy Partridge have drawn on his myth. Nick Cave and the Bad Seeds have a satirical retelling of the legend called The Lyre of Orpheus, and Baz Lurhmann’s film Moulin Rouge is partly inspired by the story, using music from Jacques Offenbach’s Orpheus in the Underworld. Towards the end of his life Orpheus turned away from worshipping any but Apollo. Previously, he had been a devotee of the god Dionysus, deity of wine, madness and ecstasy, but now he gave his allegiance to the god of poetry. While venerating the sun god at dawn, Orpheus was killed by Maenads, the frenzied female worshippers of Dionysus, to punish him for his apostasy. It is said that the women began by throwing sticks and stones at him, but the trees and rocks refused to hurt Orpheus, so that the enraged women tore him to pieces with their bare hands. Orpheus’ head continued to sing mournfully, and his lyre still played; they floated down a river until they reached the sea, and the winds and waves carried them to the Island of Lesbos. Here the head was buried and a shrine built to Orpheus, where people could consult an oracle. The Muses, the nine goddesses of the arts, pieced Orpheus together, and gave him a burial near Mount Olympus, where nightingales sang over his grave. The Muses placed his golden lyre in the sky, where we can still see it as the constellation Lyra. At last his soul was free to join his bride Eurydice in the Underworld. The name Orpheus is believed to be derived from an ancient root meaning “to put asunder, to separate”. It could be translated as “darkness”, “fatherless, orphaned”, and “to lament, to sing wildly, to cast a spell” – all these come from the same root word. Putting them together, they sum up Orpheus’ story rather well, because his wildly tragic songs enchanted all who heard them, and he continued to sing as he descended into darkness. Orpheus is an unusual name with a great deal of power. The story of Orpheus is that of a great artist whose powers were magical – one who defied death itself in his quest for love, and who suffered a cruel fate when he turned towards the light. It is a name which has weight, and even a certain amount of heaviness, but it has everything: Art, Magic, Love, Death, Suffering, Light. It doesn’t seem too strange, as it fits in with currently fashionable names such as Orlando and Orson. Orpheus received a fairly good approval rating of 65%. People saw the name Orpheus as haunting and poetic (20%), beautiful and unusual (17%), and usable, as it fits in with current trends (15%). However, 14% thought the story of Orpheus was too heavy, violent, or depressing. I was searching for a picture for my blog (crown of laurels) and wound up here. I like Orpheus a lot, but though I didn’t think of the word ‘awful’ at all, I am sometimes reminded of the word ‘orifice’ and so it makes the name seem a bit less usable to me. I had just featured Eurydice on my site so perhaps I will put a link there if anyone is curious about the name Orpheus, they can just come here! I never thought of Orpheus-orifice … I guess they do sound slightly alike! Thanks for the link: I will put a link to Eurydice on your site so people can read about her.